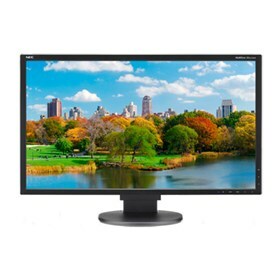 The NEC EA223WM-BK is a 23" eco-friendly widescreen desktop monitor provided with IPS panel providing wide viewing angles, color consistency and image accuracy. This display has1920 x 1080 resolution that displays incredibly clear imagery and features IPS Panel Technology as well as NaViSet software solution. The LED backlighting allows for reduced power consumption while the carbon footprint meter enables responsible use of the display conserving green gas emissions in real time. The ControlSync™ technology allows users to control up to six units in a multi-monitor configuration. The EA224WMI-BK is equipped with DisplayPort, HDMI, DVI-D and VGA D-Sub inputs. The Smart sensing technology automatically detects work conditions to determine proper display brightness with ambient light sensor. The NEC EA223WM-BK has many exciting features for users of all types. See the NEC EA223WM-BK gallery images above for more product views. The NEC EA223WM-BK is sold as a Brand New Unopened Item.